Hart District Curriculum Director David LeBarron (left) and Valencia Principal Paul Priesz congratulate Michael Fernicola on his "home run." Valencia High School senior Michael Fernicola was named Outstanding ROP Student of the Year at the Hart District’s annual Regional Occupational Program Awards event Wednesday at Wiley Canyon Elementary School. 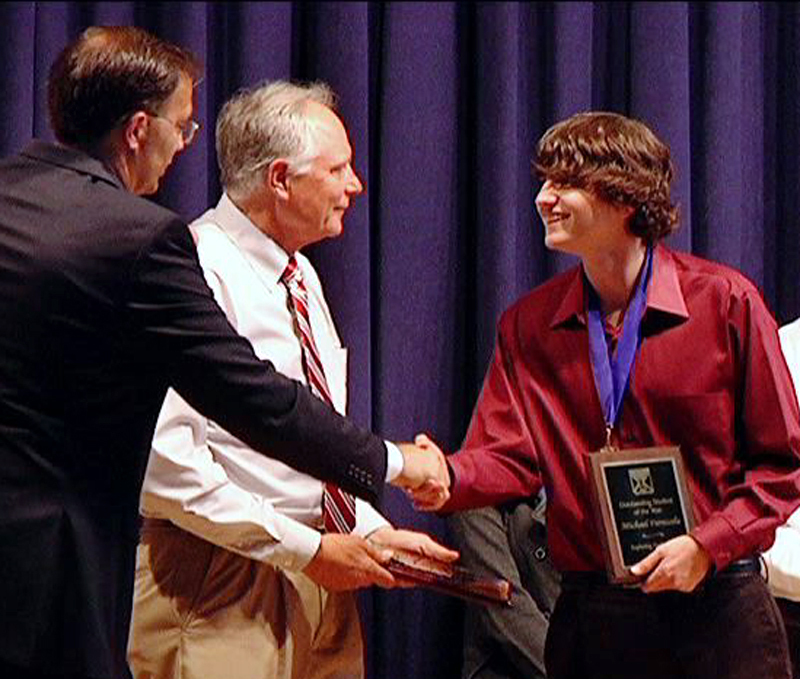 Fernicola studies engineering technologies in teacher Bryan Kerness’ ROP class and had his name added to the Hall of Fame plaque that hangs in the school district’s ROP office. In all, 18 eleventh- and twelfth-grade “MVPs” were honored for hitting home runs in their respective ROP classes during Wednesday’s baseball-themed event. Instructors nominated students, who were then interviewed by professionals in their respective industry cluster and submitted essays about their ROP experience. The Hart District’s ROP program offers a variety of career and vocational education classes designed to meet industry needs and provide students 16-and-older with marketable skills or inspire them to pursue further studies in a number of fields – from cosmetology to law enforcement and fashion design to plumbing. 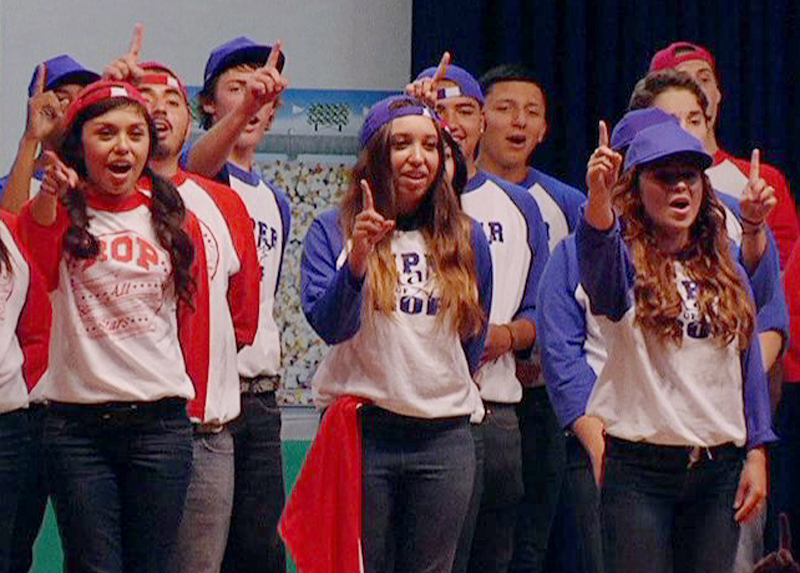 ROP students perform a chorus of "Take Me Out ot the Ball Game" for their parents Wednesday. ROP instructors partner with local business leaders to craft their curriculum and give students hands-on, “real world” training. SCVTV is a partner in the Hart District’s ROP broadcast journalism class under the direction of Canyon High School teacher Philip Scorza. Gold, silver and bronze medals were awarded to the 18 students honored Tuesday in the following industry sectors: Arts-media-entertainment, building trades and transportation, design-marketing-finance, health and child development, hospitality-tourism-natural resources, and public services. In addition, ROP graphic arts student Kayla Cox won the annual poster design contest for the event. The ROP program is headed by Hart District Curriculum Director David LeBarron, administrative assistant Jodie Hoffman and accountant Sheree Burbach. School site advisors are Mike Nugent (Bowman), Millie Gaines (Canyon), Josie Grine (Golden Valley), Kristina Stegall (Hart), Karen Varela (Saugus), Tina Olinger (Valencia) and Pat Oakley (West Ranch). Janis Fiock is the district career advisor. Wednesday’s ROP awards and entertainment event will be available for viewing on SCVTV.com.